Having a Ball | Camps | Kids VT - small people, big ideas! It was a sweltering summer morning at Champlain Valley Union High School in Hinesburg, but the dozens of red-faced kids kicking soccer balls didn't seem bothered by the heat. They were busy negotiating orange cones, dodging and darting, when head coach Stan Williams shouted, "Katie, send your pinnies here! Tucker, send your blue team over here! Half the team stays, half the team goes!" 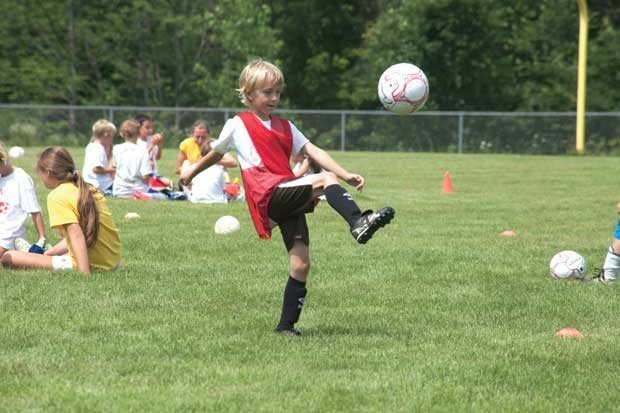 It was rotation time at CVU Soccer School, one of Vermont's many summertime programs designed to help kids take their game to the next level. 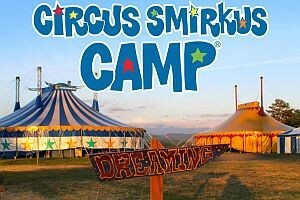 Now in its 13th year, the camp attracts more than 120 kids in kindergarten through ninth grade. Taught by 20-plus instructors, the weeklong session promotes a love for the game via "skills and tactics that are an essential part of becoming a complete player." The beauty of soccer? You can play it anywhere — even in your own backyard. "All you need is a ball and some room," says Williams. "And you can make up so many games." Williams' recommendation for parents of young soccer players: Make sure they get a chance to play. While the older kids at Soccer School were on a separate field learning skills, drills and rules, the miniest Pelés were focusing simply on having fun. Instead of being told to dribble, kids were told to act like the superhero Flash and go as fast as they could down the field with the ball. Instead of passing, they played Batman and Robin, kicking the ball back and forth to each other. There were obstacle courses, bowling pins to knock down — just about anything to engage the kids' imaginations. "I've seen lots of kids who love practicing soccer at a young age but don't like the competition," says Williams. "Parents and coaches need to keep in mind the age group. Are the practices and drills fun? Is it organized? Are all the players involved? Are all players getting lots of touches?" Parents should remember that kids under 6 can't grasp team sports or passing, says Williams. 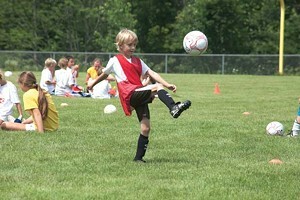 By age 8, they begin to get a feel for team sports. By 10 or 11, they can be playing high-quality team soccer. Until then, the sky's the limit in terms of playing soccer "games" with your children. The trick, says Williams, is to take common games that kids already know — such as red light-green light, sharks and minnows or tag — and add a soccer ball. After a week at CVU Soccer School, my own little dribblers, ages 4 and 6, have been keen to try out these games at home. Along with certificates for "Most Mischievous Smile" and "Stellar Offender," respectively, they each left camp with a small soccer ball — now prominently placed by the garage door as a reminder to play every chance we get. "To become balanced athletes, physically and emotionally," says Williams, "kids need to learn to have a ball on their foot. It has to be fun." As Coach Williams says, all you need to play soccer is a ball and some room. Turn your backyard into a playing field — or, on rainy or wintry days, move to your garage or basement. Even a short driveway has enough space for a game of freeze tag with a ball, for example. Wear loose, comfortable athletic clothing and sneakers; cleats aren't necessary for home play.